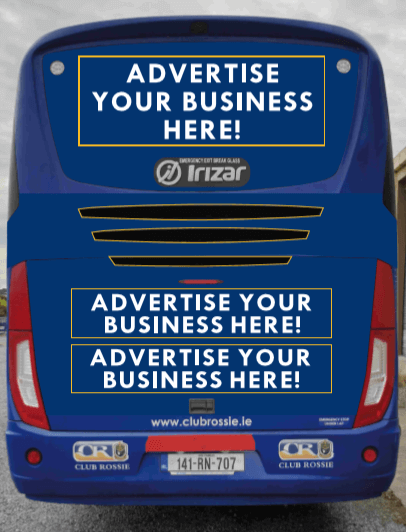 The Roscommon GAA Club Rossie Bus is known the length and breadth of Ireland as it brings the footballers, hurlers and camogie players of Roscommon to do battle in all corners of the island even in Britain it has graced the motorways and byways from Holyhead to Ruislip. The project was launched in 2014 and is now supported by ten travel partners who contribute to the cost. The Coach made over 260 trips in 2018 alone and that will increase to 320-340 trips this year. As well as being made available to County and Club teams it is also available to Club for other GAA related trips such as Social Initiative Tours. It is driven by volunteers drivers and to find out more about booking the Bus contact contact the Bus Coordinator Nuala on 087 6747177.